In the 21st Century, many Scottish runners, after glancing at statistics from the 1960s to the 1980s, wonder how so many of their predecessors ran a lot faster than nearly all the Scottish athletes in their twenties and thirties nowadays. Alex and Jim Wight are excellent examples of men who trained hard, raced over a range of distances and produced many outstanding performances. Undoubtedly they had genetic talent but this was developed through sheer effort and relentless competition. It will be far from easy for today’s youngsters to make similar progress. Alex was born on the 5th of November 1942; and Jim on the 22nd of October 1944. They both, in turn, went to Edinburgh University in time to become part of the greatest student team in Scottish athletics history. Alex was part of the EU outfit which was third in the National cross country championships in early 1965. By November that year Jim had joined him in the Edinburgh University team which smashed the course record for the Edinburgh to Glasgow Relay. Jim enjoyed a major breakthrough by taking no less than 39 seconds off the Stage 7 record, while in the lead ‘running scared’ from Bert McKay of Motherwell YMCA, who was only four seconds slower than Jim. However Bert’s team finished 80 seconds behind the flying students. While Alex tried to run 100 plus miles per week, Jim aimed for 50 to 60, although he was running up to 75 by the late sixties. 100 plus did not suit Jim, although he wonders now whether, with even more application, he might have been capable of a 2.12 marathon. Alex says that Jim had more natural ability than himself. The Edinburgh students’ success was due to the inspiration of 1964 Olympian Fergus Murray and the heroic squad of masochists who trained from ‘The Zoo’, 78 Morningside Drive. The house was named after the nicknames of certain inmates: Fergus was ‘The Beast’ and Chris Elson ‘The Bear’. Other fine runners who lived there some of the time included Alastair Matson, John Meldrum, Brian Covell, Dave Logue, John Bryant and the Wight brothers. Don Macgregor came through from Fife for the Sunday session. It was the toughest training school in the land. Up to100 miles or even more every week of long runs, repetitions, fartlek and races, in an ambitious, competitive group. Improve or retire! For EU and subsequently EAC in the E to G, Alex won two gold and five silver medals. He was first reserve for the 1967 winning EU team! Jim won three golds and a silver. However it wasn’t just about road running. In true harrier tradition, the Wights raced ferociously in cross country. Jim’s finest result was probably 17th in the 1972 English National at Sutton Coldfield, coming through very strongly despite the notorious blizzard. In the Scottish National event, between 1965 and 1979, Alex won seven gold, three silver and three bronze medals. Jim was in the winning EU Junior team in 1964 and 1965. Between 1967 and 1975, Jim won four Senior gold, two silver and two bronze, plus an extra silver in the National Cross Country Relay. They both featured in the greatest team performance in National history, in 1975, when EAC’s six counters could only total a measly 37 points! Alex, whose best individual place was 8th, was unlucky not to run for Scotland in the International Cross-Country Union Championships. 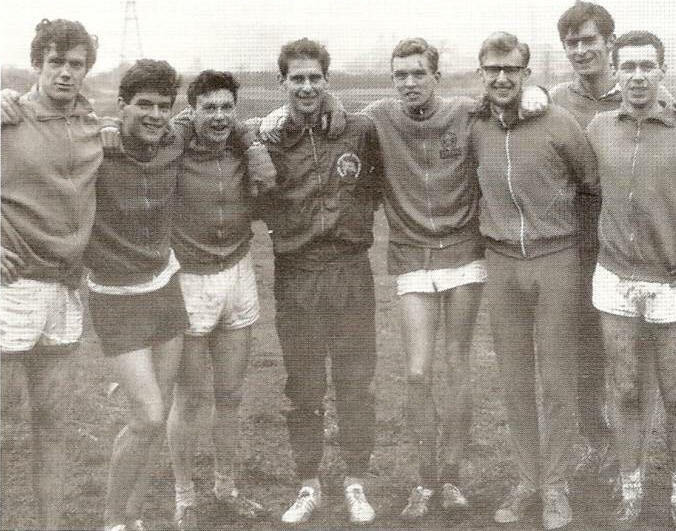 Jim, however, ran for the junior Scottish team in Dublin 1964; and also the senior Scottish team in Cambridge 1972.
n the track, Alex improved his 1969 times [14.43 5000m and a (team effort) steeplechase in 10 minutes precisely] to14.32 in 1973, 9.47 in 1973 and, more significantly, for 10.000m, 29.38 also in 1973. Jim went from 14.48 in 1969 to 14.17 in 1972, and had a PB for 10,000m of 29.22 in 1973. However a major focus for this website is marathon racing. All the above intensive training and racing led to excellence in the marathon and indeed the so-called ‘shorter ultras’. Even when I joined Edinburgh Southern Harriers in autumn 1974, the Wights’ legendary Sunday run persisted. This featured a gruelling tour of Pentland reservoirs and went on and on for at least 20 miles at a very unsocial pace; which might explain why I usually chose the softer option of 16 miles along the disused railway line to Balerno and back. It took me months to follow my own training pack (led by iron man Sandy Keith) up to the infamous reservoirs. Eventually we learned to endure the occasional 25 miler – but always avoided those hard men, the Wight brothers! Alex started his marathon career in the Beverley East Yorks race in April 1966, finishing second to Don Shelley in 2.23.15. However he suffered what he describes as ‘a dose of hot weather reality in the June Polytechnic race in 2.52’! He raced on the road at all sorts of distances in North and South England, as well as the Scottish Highland Games road race circuit, although the intended goal was always improved marathon performance. In 1969 Jim won the Highgate marathon in 2.24.28, with Alex fourth in 2.31.07. Next year Alex was third in the SAAA 10,000m track, just in front of Jim, and maintained this slight sibling advantage in reducing his marathon time to 2.21.05 (5th in the famous Polytechnic race from Windsor to Chiswick). Alex considers this performance, in what was the English Commonwealth Games trial, one of his best races, partly because he finished just in front of A.J. Wood. Jim did 2.22.58 for 8th in the 1970 Scottish Commonwealth trial event. The Edinburgh to North Berwick marathon on the 8th of May 1971 produced seven PBs for the first eight finishers. Alex Wight won in the superb time of 2.15.27, with Jim second in 2.15.43. That autumn Alex increased the distance by winning the Two Bridges 36 mile race from Dunfermline, over the Kincardine and Forth Road Bridges to Rosyth. His time was 3.28.20. As an afterthought, he also won the Edinburgh to Glasgow Individual Race (and for EAC, inevitably, the team award!) His own account of this event is given in the Point to Point section of this website. Jim started 1972 in the best possible fashion by outkicking Jim Alder on his own ‘turf’ to win the famous Morpeth to Newcastle. Jim Wight regards this as his most satisfying road race. In the Olympic trial Maxol Marathon in Manchester, Alex finished a disappointed 24th in a respectable 2.19.59, but found better form in retaining his Two Bridges title in a record 3.24.07, with Jim second. This, along with his fine marathon PB, was to represent the very best of Alex Wight, long distance runner. From then on, Alex seemed to concentrate on shorter races, apart from 2.21.53 in 1974 (Harlow). Jim, two years younger, reached his peak in 1973-4. After his best 10,000m time, he lined up for the Scottish Championship marathon (which was the trial for the Commonwealth Games team). A small, select group raced off on a very hot day, with a following wind. The headwind on the return journey added to the strain for those who could not keep up with the leaders. Even Alex dropped out eventually. Jim, however, was only 34 seconds behind the winning 2.17.50 of Donald Macgregor, who told the press that “Plucky Jim Wight should come with me to the Christchurch Games.” Indeed they were both selected. A well-known photo of the time shows the 1974 Commonwealth Marathon leading pack, with fiery-eyed Ian Thompson tormenting a suffering group who are straining to follow his 2 hours 9 minute pace! Don Macgregor is there, with Jim Wight hanging on grimly. In the end Don finished 6th in 2.14.15, his best ever, but Jim was forced to step off the road. However Jim Wight made a great return to form later in the year when he won the Two Bridges in 3.26.31; and then romped away to an easy victory in the Harlow marathon in the excellent time of 2.16.28, also gaining revenge on Don Macgregor who finished third in that race. EAC won the team title from Edinburgh Southern Harriers – not bad for Scottish runners in Essex! In between the Two Bridges and the Harlow, from 6 p.m. on 28th September 1974, at Meadowbank Stadium, Edinburgh Athletic Club broke the world record for the 24-hour 10-man x 1 mile relay. This outstanding feat even out-performed the world best for a composite team and the U.S. Olympic Training camp select, in addition to the record for members of a single athletics club. Their final distance was 297 miles 1145 yards (or 479.009 kilometres). This translates to an average of 4 minutes 50.27 minutes per mile. The heroes were: Jim Alder, Jim Dingwall, Doug Gunstone, Phil Hay, Danny and Ronnie Knowles, Alex Matheson, Joe Patton and, unsurprisingly, Alex and Jim Wight. Truly an amazing achievement. Jim seems to have retired from racing after the National Cross Country EAC team massacre in 1975; Alex kept going in that event, gaining further team golds in 1976 and 1978, with a swansong silver in 1979. The Veteran/Master scene was in its infancy and obviously did not appeal particularly to the Wight brothers, although in the 1980s Alex did run 2.32 for 8th in an Edinburgh Marathon plus almost exactly the same time in a London Marathon. Alex remembers thinking even then that the British standard was on the way down. At a recent EU cross-country reunion, he found it interesting to meet people who were useful in their university days but were only fringe team members then, who later turned out to be champions at national and world level – true marathon runners. The Wight brothers achieved so much. Each took his turn to defeat the other, without apparent animosity. Alex seemed to me casual, ‘cool’, and friendly – a true amateur – while Jim was silent and serious. However they both trained and raced like demons! Alex may have smiled more often but both Wights must have enjoyed their running a great deal. They have every right to look back with considerable satisfaction on marvellous athletic careers.